Welcome to Hersey Pool Service in Jax and thank you for visiting our website! For many years, we’ve been providing professional pool cleaning services. 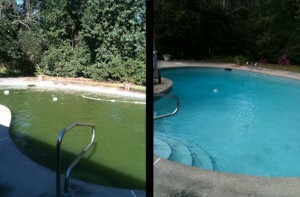 It’s our job to offer a residential pool cleaning service that’s top-notch and cost effective. When it comes to offering a pool service in Jacksonville FL, we believe that we offer the best and most reliable services in the area. If you own a pool or spa, then you know how difficult they can be to maintain. We offer a weekly maintenance service, so that you can have your pool or spa maintained for you. With this service, we will visit your home or business on the same day every day of the week. Our clients greatly appreciate our reliability and our dedication to regular maintenance. We also provide swimming pool brushing and cleaning services. Sometimes, pressure washing is just not enough and for these tasks we will literally use a brush to clean every nook and cranny of the pool. vacuum. This allows us to vacuum out your swimming pool, getting rid of any dirt, debris, or algae. It also efficiently vacuums the sides and bottom of the pool, getting rid of any lingering bacteria. Regularly cleaning the surface of a pool can be tough work, but it’s something that we have specialized in since the very beginning of our pool services. Adding chlorine and making sure that the chemicals in your pool or spa are at a proper amount is something that you have to do regularly. We provide water testing and chemical maintenance services, so that this entire process can be handled for you. Every pool has a filter, or even multiple filters that need to be cleaned from time to time. We offer a professional filter cleaning services for pools and spas! If you would like us to clean the tile in or around your swimming pool, we can provide this as well! We provide prompt and professional tile cleaning services to make your pool look its best! Aside from our pool maintenance and cleaning services, we also provide swimming pool repair. If you have a broken part such as a pump, filter, valve or timer, we can repair that item for you quickly and cost efficiently. We also provide leak detection and repair, as well as a wide variety of other repair services. Similarly, if you have a salt system swimming pool, we can provide repair and maintenance services for these pools as well. Here at Hersey Pool Service, we provide everything that you need. If there is an additional service not listed here that you would like us to provide, we may be able to do it. This includes pressure washing your swimming pool deck, doing green pool cleanup, or even do-it-yourself classes to learn how to maintain your own swimming pool.